Quick pressure release or natural pressure release? It’s one of the most common questions I get. 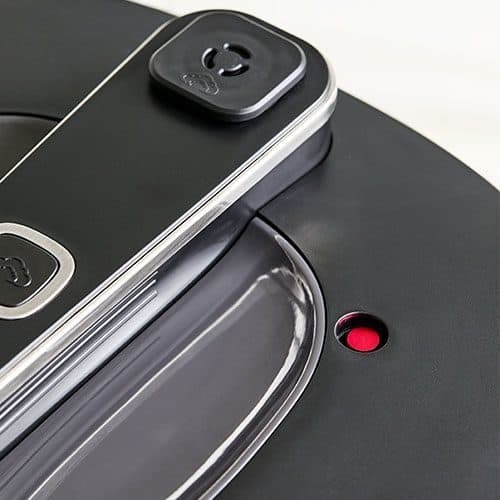 Electric pressure cookers and multi-cookers like the Instant Pot, Ninja Foodi, and Crockpot Express have the ability to release pressure two ways. Let me explain the difference! Releasing the pressure can be a little intimidating to people who are new to pressure cooking—especially the quick release with the noise and jet of steam. But don’t let a little noise get between you and fabulous meals cooked in your pressure cooker! Here are the most common questions and answers for the different types of pressure releases. What is the difference between a quick pressure release or natural pressure release, and when do I use them? Those are often the first questions new pressure cooker users ask. So I thought it would be a perfect time for a post explaining it for all those who have an electric pressure cooker or multi-cooker like the Instant Pot waiting for them under the tree. When the cook time ends, your pressure cooker will beep. At this point, the recipe will direct you to release the pressure in the cooking pot. You can release the pressure two ways: a quick pressure release or a natural pressure release. Q: What is a Quick Pressure Release? 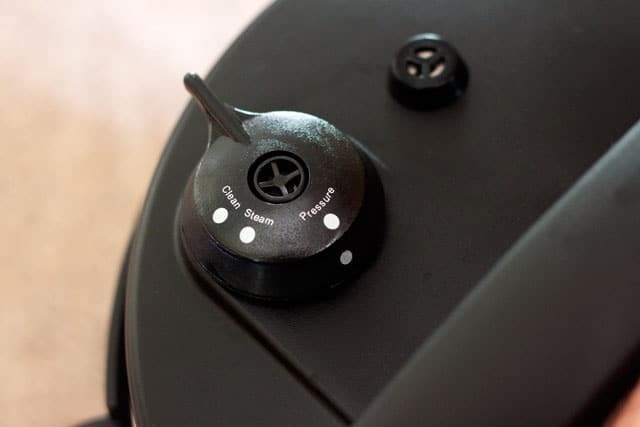 A quick pressure release is when you turn the pressure release switch to the Venting position and let the steam to release quickly when the cook time ends. This will result in a strong jet of steam coming from the pressure release valve. This is normal. If drops of liquid or foam start to emerge from the pressure release valve, simply switch the valve back to the Sealed position and use an Intermittent Pressure Release. 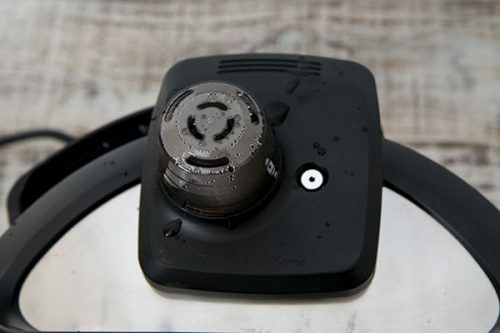 Instant Pot Duo: Turn the pressure release handle from Sealing (triple-S icon) to Venting (steam icon). Ninja Foodi: Turn the pressure release valve from Seal to Vent. Crockpot Express: Turn the steam release valve from the Closed/Seal position (X over the steam icon) to the Open/Release position (steam icon). Power Pressure Cooker XL: Turn the pressure valve from the Lock position (bulls-eye icon) to the Open position (steam icon). Fagor Pressure Cooker: Turn the valve from Pressure to Steam. Cuisinart: Turn the valve from Pressure to Pressure Release. Pampered Chef Quick Cooker: Press the Steam Release Button on the lid handle. Other pressure cookers may have different labels, but it’s the same basic principle. Turn the valve to allow the steam to escape / pressure to release. When the pressure is fully released, the float valve will drop and the lid will unlock to open. For safety reasons, the pressure cooker will not open until the pressure is released and the float valve has dropped. Keep your face and hands away from the steam as it’s released. Don’t release pressure under hanging cabinets, which can be damaged by the steam. Don’t use a quick release with ingredients that foam or that have fatty or thick ingredients. Q: When do I use a Quick Pressure Release? Using a quick pressure release stops the pressure cooking quickly. Therefore, you should use a quick pressure release when you are cooking ingredients, like vegetables, that you want to avoid overcooking. I use a quick pressure release when I make my Quick Pressure Cooker Potato Salad so the potatoes are tender but still chunky and hold their shape. Don’t use a quick release with ingredients that foam or have fatty or thick ingredients. Q: What is a Natural Pressure Release? A natural pressure release is when you leave the pressure release switch in the Sealed position when the cook time ends. This lets the pressure release slowly, without you doing anything. When the pressure is fully released, the float valve will drop and the lid will unlock and open. A natural pressure release is a bit anticlimactic in comparison to a quick pressure release. There is no jet of steam when the natural pressure release starts. There’s also no clear way to tell when the pressure is fully released, and no beep or signal when the lid unlocks. Sometimes you can hear the float valve drop if you’re close by. The time it takes for the pressure to release naturally will vary depending on the ingredients and amount of liquid in the pressure cooker. A natural pressure release can take from 5 to 30 minutes in the electric pressure cooker. Food inside the cooking pot will continue to cook as the pressure decreases. Q: When do I use a Natural Pressure Release? Using a natural pressure release allows the cooking to stop gradually. You don’t want to open the valve quickly when the ingredients inside could be foaming. You’ll get foam shooting out through the valve, so use a natural pressure release when making steel cut oats, a large pot of soup or pasta. You also want to use a natural release for large cuts of meat. Just like you’d let meat rest after grilling it, a slow natural release is said to let the meat relax and be more tender. During a natural release, the cooking continues so you need to take that in to account when determining your cook time. If a recipe calls for a Quick Release, you can use a Natural Release if you prefer, but reduce the cook time. Q: What is an Abbreviated Natural Pressure Release? The different types of pressure releases can also be combined. You don’t have to wait for all the pressure to release to get the benefit of a natural pressure release. In many of my recipes, I will let the pressure release naturally for a certain number of minutes, then I will finish with a quick pressure release. I almost always only wait 10 minutes before I release the remaining pressure. Combining the two release options reduces waiting time yet gives you many of the benefits of a natural pressure release, such as reducing foam and tenderizing meats. Q: What is an Intermittent Pressure Release? An intermittent pressure release is the best of both worlds. It’s a way to quickly release pressure for foods such as pastas, soups, and certain grains, which are prone to foaming or spitting if you try to release pressure with a quick release but would be overcooked with a natural pressure release. With this method, you open and close the pressure release valve in short intervals. This allows the pressure to escape more quickly than a natural pressure release and also prevents foam from coming out of the pressure release valve. With some foods, one or two closed intervals is all I need before I can leave the valve in the Venting position; with other foods, if the foaming is particularly bad, I will close the valve and wait a minute or two, then slide the valve to Venting again and continue opening and closing the valve as needed. Q: Do I need to turn the pressure cooker off before using a Quick Pressure Release or a Natural Pressure Release? No you do not need to turn the pressure cooker off for a quick or natural pressure release. The pressure will release on the Keep Warm setting. The benefit of not turning it off is that the time will count up so you can see how long it’s been since the pressure cooking time ended. There is some debate about whether or not the pressure releases more slowly if it’s on the Keep Warm Setting. 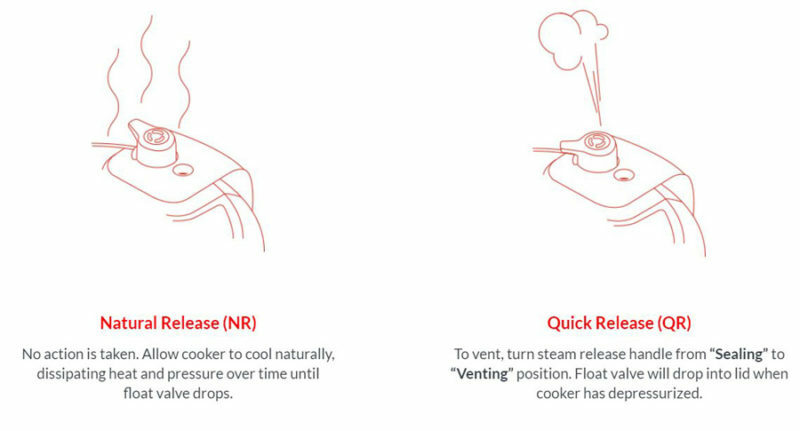 The Instant Pot Company’s official position is that it does not release more slowly on the Keep Warm Setting because the Keep Warm heat does not turn on until the pressure has been released. I prefer to turn off or unplug the pressure cooker before I do a quick pressure release or natural pressure release. I seem to always forget to turn off the pressure cooker if I don’t turn it off when the pressure cooking ends. I also prefer to set a timer to remind me 10 minutes has passed and it’s time to release the pressure when I’m doing a natural pressure release. >>That should be everything you need to know about pressure releases! You’re ready to move on to the next section! 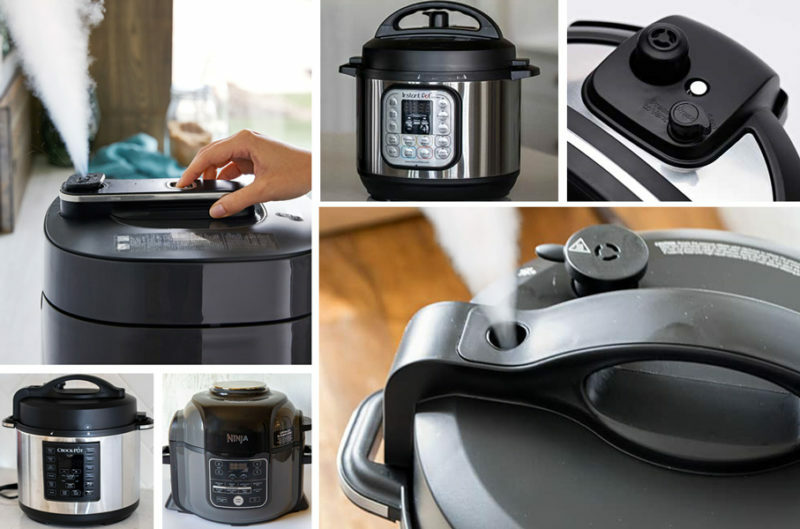 Part 3 in our Getting Started Guide will walk you through an initial test run for your Instant Pot, Ninja Foodi, Crockpot Express, or other brand of electric pressure cooker. If you’re in a hurry to get cooking, you can always skip to our Make Your First Meal post and come back to this information while you’re waiting for the chicken to cook. Once you have your first meal under your belt, move on to some easy pressure cooking recipes. Before you know it, you’ll be making fabulous pressure cooker meals and wondering how you ever cooked without it. Hello there! I am wondering what is the time duration on a quick release usually? You note in your article that natural release takes 5-30 min but never say about quick release:) Also, I notice when doing quick release that if I prop a fork under the valve lip it releases even faster. Aside from any warning about dangers, does this little cheat “ruin” the cooking process? Thank you so much for writing this article: very informative! Hi Amber – the time for a quick pressure release also varies depending on what you are pressure cooking. It could be as short as 1 minute to more than 5 minutes. No, it won’t ruin the cooking process, but don’t underestimate the danger. I overrode the safety features once to open it up more quickly and was amazed at the force of the pressure and soup sprayed all over. So now I’m more patient. When using the crock pot setting on the Ninja foodie, are you to leave the valve sealed or venting? Hi Barb – you’ll leave the valve in the venting position. What you call “natural pressure release” is not a release at all. Nothing is released, but rather the temperature drops which in turn lowers the pressure level. Release refers to letting go or setting free but nothing is set free or let go in the “natural release”. As the temperature lowers the pressure will dissipate in proportion to the temperature. Hi Hans – although you may not like the term, it is the terminology most manufacturers use to describe the two different release methods. 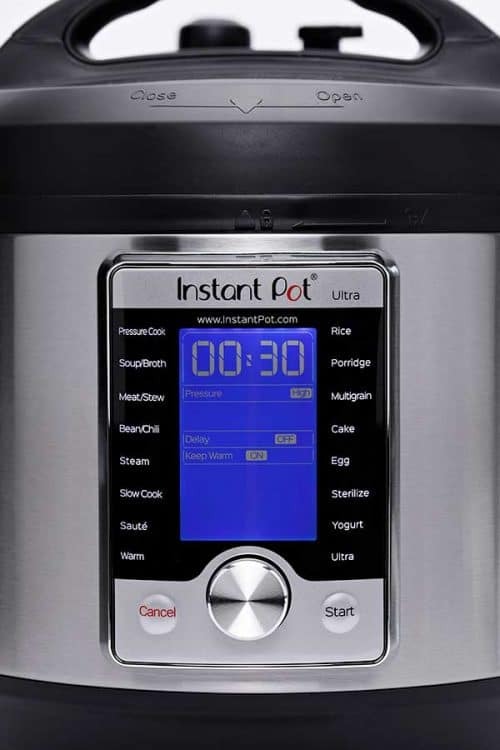 You’ll find it in the Cuisinart PC manual page 5 (my first pc) and the Instant Pot manual https://instantpot.com/quick-release-natural-release/ It really is just a shorthand way of saying the pressure dissipated naturally (released naturally). Hans, if you are going to be obnoxiously pedantic in an article about using a kitchen appliance you could at least be right. During a natural pressure release you are lowing the pressure. Energy is leaving the system (released!) which causes pressure to drop. The equation that models this (the ideal gas law) is “P = nRT / V. Venting the instant pot releases the pressure, which is “n” in that equation, while letting it cool releases heat, which is “T” in that equation. Thanks Christie – glad it was helpful. Have fun! Great article! I wish I saw this when I first got my IP. I would only use recipes that told us to NPR or QR. If that info was left out, I skipped that recipe. I’ve often wondered about another NPR situation. As an example, say the recipe says to NPR for 15 minutes but my pin drops at 10 minutes. Should I still keep it closed for the remaining 5 minutes or will it not make much of a difference once the pin drops? Thanks! It depends on the reason for the natural release. If you’re cooking rice then the rice needs the natural release time to steam. If you’re cooking soup the partial natural release time helps avoid having hot soup come up through the valve – if the pin drops before the 15 minutes then you wouldn’t need to wait the entire 15 minutes to open it. This explanation is exactly what I needed. Thank you so much! Great – glad it was helpful Jovi! Hi. I just made a chicken recipe and forgot to wait the 5 minutes after cooking on high pressure for 5 minutes. I quick released right away. Will my chicken be cooked enough? What do i do to correct the situation? Hi Sylvia – if you have an instant read thermometer check and see if it’s at 160 degrees. If not, I would saute the chicken in a pan on the stove for a few minutes until it reaches temperature. I did this as directed. Not sure what happened. Meat wasn’t flavorful and not as tender as I’d like. Hi Jannell – generally if the meat isn’t tender, it needed to cook longer. If it wasn’t flavorful you probably used too much liquid, not enough seasoning, or the meat was too lean. Which recipe did you use? Very insightful and well explained! Very helpful. I have the Power Cooker Plus and most recipes refer to the settings on the Instant Pot. This helped clear up my confusion about the steam slow release. I thought my Power Cooker was missing a setting! could you give some general guidelines on how much reduced cooking should occur when you go from quick release to Natural release mode? For example if I’m cooking lentil soup and it asks for a 12 minute cooking time with a quick release, how much reduce cooking time should I Implement if I want to use a 10-minute quick release? This is a truly helpful post. I’ve had my IP for awhile, but an article like this is a great refresher. Thank you! When using the slow cooker for chili, do you leave the valve open or closed? The vent is in the open position for slow cooking. A lot of people use a glass lid – you may have one with a pots and pans set that will fit. Thank you for this! I’m an Instant Pot Newbie here, only four recipes in! This definitely clarified the cancel or not option for natural release. Hi Joan – I’m not familiar with that brand. Typically, most of the pressure cooker settings are high pressure. If you have a manual that came with the pressure cooker, it should explain about how to release the pressure. I couldn’t find a manual online. Hope its the right one. Thank you so much for posting this article. I have a Crock pot Express and the manual is not clear on the difference between natural release and quick release and when to use it. This was very helpful.